Samsung has at last not only reimagined its design language to meet today's standards for what is considered a “premium” smartphone, it has done one better and employed its “Edge” tech to deliver a flagship with a curved screen. The Galaxy S6 edge looks stunning with its wraparound display, while its hardware is just as bleeding-edge as the one found under the Galaxy S6's hood. 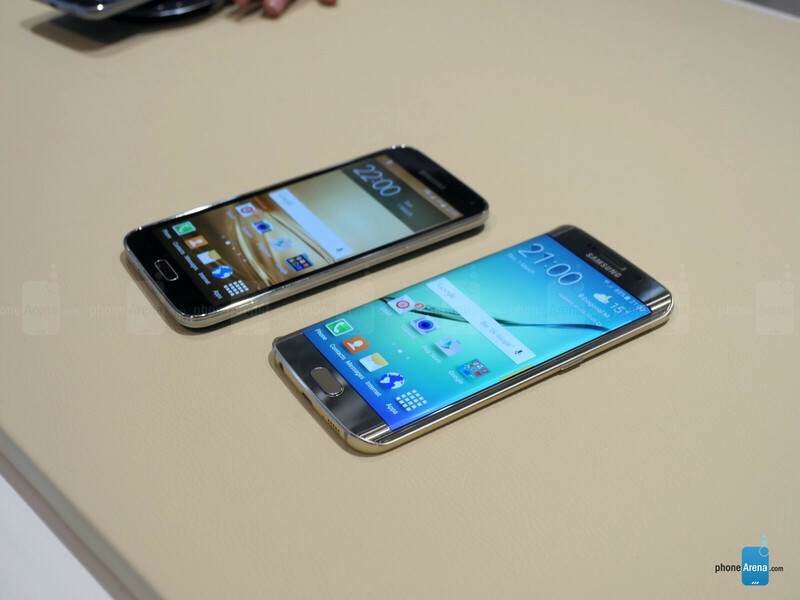 So, how does this new stunner compare to the old Samsung flagship – the Galaxy S5? Let's check them out, side by side! The Galaxy S6 edge adheres somewhat to the familiar oval shapes that we've come to expect from Samsung, however, its curved edges give the device an almost bezel-less look, making it appear fresh and futuristic. Additionally, the phone is adorned by a metal unibody construction, with Gorilla Glass 4 on its back as well as the front – much more fun than the Galaxy S5's plastic body and rather dull patterns, if we dare say so. Both handsets have the now-famous lump on the back which is there to house their potent camera sensors, but more on that later. 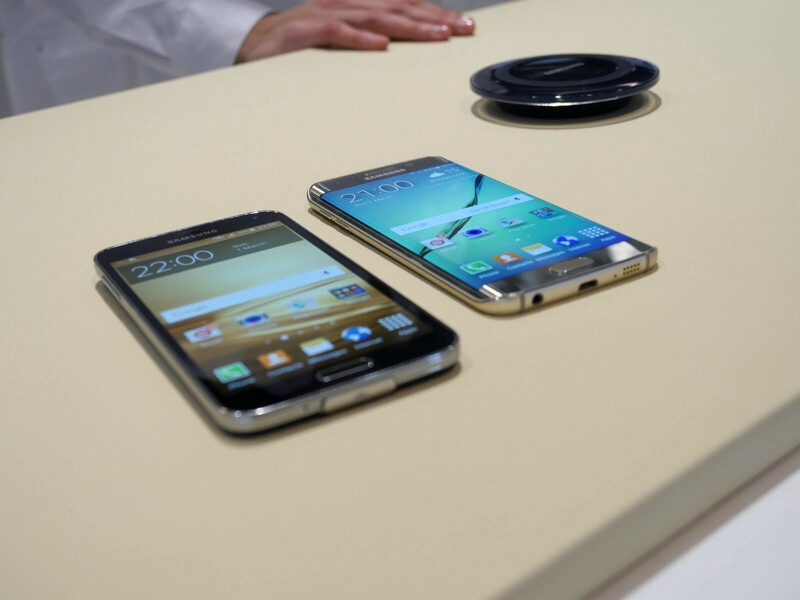 Both handsets have a 5.1” Super AMOLED display, but the Galaxy S6 edge, obviously, has a very differently shaped glass on its front – one that is curved to the side on both its ends. This aside, the S5 sports a 1080 x 1920 resolution, while the S6 edge is now firmly in QHD lands, which means it has 1440 x 2560 pixels stretched across its diagonal. It is arguable whether one would be able to notice the individual pixels on each of the screens – the S5's PPI density lands at 432, while the S6 edge's is up at 577 – both numbers are the telling signs of an extremely crisp display, so many may argue that the jump to QHD would just put an unneeded strain on the phone's hardware. The Galaxy S6 edge, however, shows much tamer, color-accurate images, on its Super AMOLED panel, instead of being punchy and vivid all the time. Fear not, if you miss the screaming colors of the S5, the S6 edge's settings have enough display modes to satisfy your needs for some vivid AMOLED colors. While the Galaxy S5 is powered by a solution by Qualcomm – the Snapdragon 801 SoC, Samsung went with an entirely homemade SoC for the Galaxy S6 edge, housing a 64-bit octa-core CPU, built on a 14 nm process, which should mean faster performance and more energy efficiency. Galaxy S6 edge also has a new type of internal memory – a new tech, based on the UFS 2.0 standard, brings read speeds up to 2.7 times faster than the currently used NAND flash. Additionally, the S6 sports 3GB of super-fast LPDDR4 RAM, giving it more multitasking prowess, compared to the S5's 2 GB of DDR3 RAM. Samsung has been promising to slim down the cluttered TouchWiz for a while now. So, here's the new TouchWiz – slightly simplified, flatter, and somewhat cleaner, while retaining core TouchWiz looks and characteristics. For the time we had to play with the device, we can say that it did feel snappier than our Galaxy S5 unit, but it's still early to cast final judgment – we need to take the new handset for a wild ride through our tests until we can say if its interface is all that Samsung promised it would be. The phones appear to have similar cameras, as both use a 16 MP sensor, but the Galaxy S6 edge has received an OIS upgrade, and its aperture has been widened to the impressive F1.9, which allows more light into the snaps and give us better depth-of-field effects, compared to the F2.2 one on the S5. Picture taking is fast, and Samsung has added a Camera launcher shortcut to help us make use of the snapper, no matter what we're doing on the phone at the moment – a double tap of the home button calls up the viewfinder, and it does so impressively fast, too! The frontal snapper has also seen a significant upgrade – from 2.1 MP on the S5 to 5 MP on the S6, which also sports a wide F1.9 aperture, promising better, more detailed, well-lit selfies. The Galaxy S5 has a 2,800 mAh battery, which lasted 7 hours and 38 minutes on our battery life test – a very good result, guaranteeing that users would rarely find themselves out of juice in the middle of the day. The Galaxy S6 edge has a slightly smaller, 2,600 mAh battery, however, with its advanced processor and internal memory, and the lighter TouchWiz, our expectations are that it will be able to keep the lights on for just as long as the S5 is. Additionally, the S6 edge employs a quick charge tech, which should be able to grant the phone enough energy to last it 4 hours with just 10 minutes of charge time. 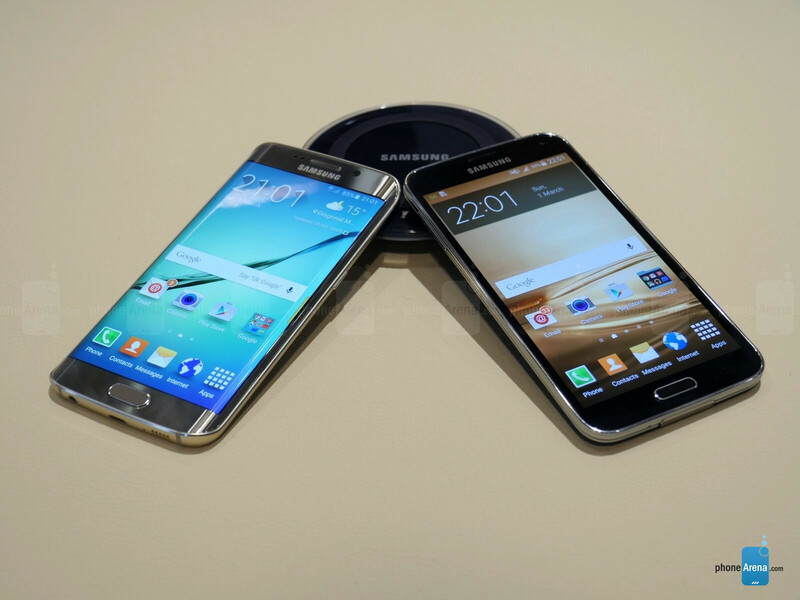 Furthermore, the Galaxy S6 now supports wireless charging from both major standards – WPC and PMA, delivering a universal wireless charging experience for most situations that users may find themselves in. There are never too many articles on Samsung devices. They blow Apple out of the water. Here, I can't see those who always complain about Samsung design right now. Only if they can have a better placement for their front logo. Waiting for a real test of camera.These pictures i saw don't convicted me.camera till now is a weakness of s6.